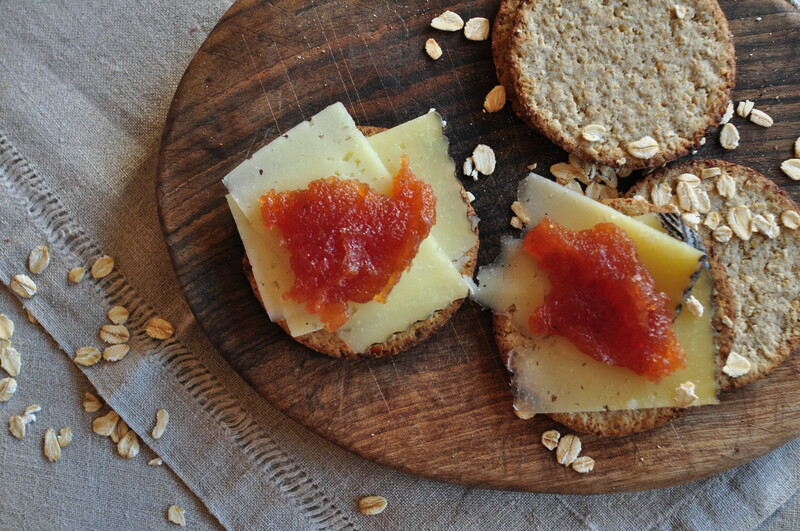 Quince paste, also known as membrillo in Spain or cotognata in Italy, is a thick, sweet fruit paste that pairs perfectly with Manchego and other types of hard sheep’s milk cheeses. It keeps for a while though it never lasts long. I eat it off the tip of a knife when the children aren’t looking. It’s irresistible. I use the fruit cooked to make quince jelly for this recipe, but the quinces could also be baked, covered, in a low oven (300°F or 150°C) for about 1 1/2 hours. Purée the quinces with a vegetable mill (the skins and seeds will be retained by the mill). Weigh the purée and add the same amount of sugar in a heavy-bottomed saucepan. Add the juice from half a lemon per 2 lb (1 kg) of fruit. Mix, bring to a lively boil, and stir constantly (otherwise the quince will burn very quickly) until the mass darkens and thickens. Depending on the amount of purée, it may take more than an hour. Pour onto a large flat plate or shallow container and let set. Quince paste keeps for months in the refrigerator. This entry was posted on 3 November 2010 at 08:58 and is filed under Fall, Homemade and preserves. You can follow any responses to this entry through the RSS 2.0 feed. You can skip to the end and leave a response. Pinging is currently not allowed. this sounds so good! do you think i could puree the fruit with a blender? or alternatively, what is a fruit mill in german, do you know by any chance?